"This is a very delicate onion ring. My Grandmother's recipe. I have never found any to compare to hers." Heat the oil in a large heavy skillet over medium-high heat, or deep-fryer to 375 degrees F (190 degrees C). Place the flour in a shallow baking pan, and stir in 1 teaspoon of salt and 1 teaspoon of pepper. In a medium bowl, whisk together the egg whites, milk, vinegar, and remaining salt and pepper until frothy. 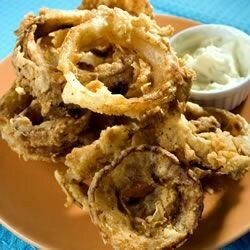 Dip the onion rings in the wet ingredients then into the flour mixture until coated. Then dip in the egg white mixture again, and then into the flour again. Fry onion rings in the hot oil a few at a time so they are not crowded, until golden brown. Drain on paper towels, and serve immediately.